Here and Elsewhere: Your latest series, Island, is a series of pictures of the Palm House in the Royal Botanic Gardens, known as Kew, in England. 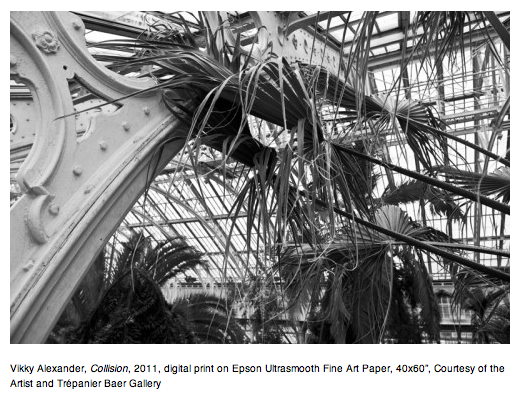 The images combine the architecture of the wrought iron and glass building with the palm trees growing inside it. What drew you to this space? Vikky Alexander: My work since 1986 has focused on the interaction/collision of architecture and nature, starting with Lake in the Woods installation (now in the collection of the Vancouver Art Gallery) in 1986. I have been researching environments where that happens and a logical site for that interaction is in formal gardens. I was attracted to the French formal Gardens of the 18th Century, particularly those designed by Andre Le Notre. I was also interested in the gardens as a type of utopia. Following that thread it was logical to become interested in glass architectural forms. Most of them no longer exist as they were not built as permanent structures and were susceptible to fires. But the Palm House designed by Decimus Burton and Richard Turner, built from 1844-1848, is probably the most well-known and preserved example of this building style. It was built to house the exotic palms and plants being collected in the colonies and brought back to England in the Victorian period. H&E: What does the title of this series, Island, refer to? VA: The title of the series refers to the novel Concrete Island written by J.G. Ballard in 1974. In the story the protagonist’s car veers off a multi-level motorway and lands on a verdant traffic island. He finds himself wounded and stranded on the island, unable to make contact with the motorists zooming by or the inhabitants of the closest high-rise apartment buildings. Neither he nor his vehicle can be seen in the foliage. Thus he becomes a virtual ‘Robinson Crusoe’ of the 20th Century. H&E: Each of the works in the series has its own title – some like Collision seem to suggest a confrontation between the natural world and the man-made architectural structure that surrounds it. 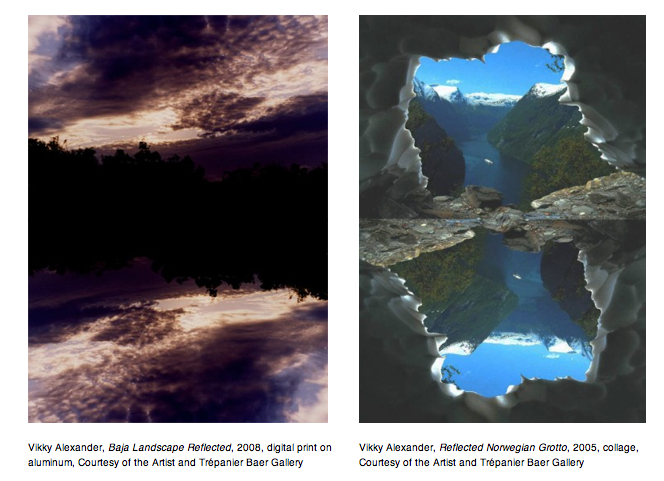 Is this tension between nature and culture an important aspect of this work? VA: Definitely. I think it has been a critical element in my work for around 25 years. There is a utopian desire in being as close to nature as possible without necessarily realizing that nature is chaotic and not necessarily benign. My experience in the Palm House made me feel that the plants themselves had finally grown enough to threaten the architectural structure that had held them captive for so long. Sort of a metaphor for the how the Victorian colonies came to feel. H&E: You’ve recently started a series of drawings that resemble 18th century engravings featuring pastoral scenes with architectural follies and slightly out-of-place animals. Although the subject matter is so different, we started to think of your earlier bodies of work like the West Edmonton Mall series where mirrors act as foils for the viewer denying them a clear view of the space, as well as your inkjet on canvas works where the outside world encroaches on the sleek contemporary interiors in the form of huge daisies and threatening icebergs, or even your chairs made of mirrors, all of which have an unnerving and surreal quality. Can you talk a bit about this unsettling and dream-like quality in your work? VA: In 1988 I made a series of photographs in the West Edmonton Mall. The mall was relatively new at that time and I was interested in the way that the developers /designers had incorporated elements of nature (albeit false) such as a lagoon and beach into the architecture. The ceiling was primarily glass, flooding the mall with natural light and all the support structures were covered by mirrors so the whole building seemed to float. They also had areas where peacocks and birds were penned in as well as large tanks of exotic fish. I thought of it as a contemporary 19th Century World’s Fair where exotic phenomena of nature were featured as specimens behind glass. The two centuries seemed to collide for me. Similarly an installation that I did in 1998 called Vaux le Vicomte Panorama incorporates a laser disc projection of panoramic images of the garden that Le Notre designed for Nicholas Fouquet in 1661 and eight mirrored columns. I see the inkjet on canvas works relating directly to the Island series, even though they are so full of color and appear more playful. As you suggest, the elements of nature are astonishing in scale compared to the architecture from which we view them and they threaten the apparent harmony of the domestic interior. The small drawings that I started in Paris in 2009 are of the various architectural elements that were designed by M. de Monville for his French Folly Garden, Le Desert de Retz, completed in 1789. They are copies of the engravings that were made at the time, with the addition of exotic and wild animals. The animals do look out of place, as if they were suddenly set free from the zoo and suddenly became aware that they are in a completely artificial environment, not in their natural habitat. H&E: It seems as though much of your work – in a range of media – has featured architecture. Can you tell us a bit about your interest in architecture? VA: I first became interested in architecture when I studied with Dan Graham at the Nova Scotia College of Art and Design in the late 1970’s. Dan was very influential to my work. At that time I was also lucky enough to take an independent study course in architecture with Larry Richards at TUNS. Probably the first book that I read on the subject was Learning from Las Vegas by Robert Venturi and Denise Scott Brown and my interest could be synthesized in their expression ‘the Architecture of Persuasion’. I’m interested in the areas of architecture where there is a relationship between the physical structures and spaces of wealth and consumerism – malls, property developments, casinos, furniture showrooms, Crystal Palaces – and the dream world of fantasy and desire they perpetuate. As you can see I have been attracted equally to the West Edmonton Mall, the arcades of Walter Benjamin, the gardens of Andre Le Notre, the houses of R.M. Schindler and Richard Neutra, the projects of Bruno Taut, Boulee and Ledoux….It’s where I get ideas. H&E: Would you describe your work as a contemporary take on the Romantic tradition which placed emphasis on feelings of awe and sometimes even terror by evoking the sublime, grandeur of nature? VA: I didn’t expect this interview would become philosophical. But actually no, I think of my work as the opposite of sublime. The way that I understand the sublime, it is usually overpowering and all-consuming in its beauty and terror, like a narcotic. That is something that I try to avoid by making work that forces a moment of self-realisation on the viewer in an ontological way. Physically locating oneself in relation to my works has always been very important, from the 1980’s to the present. This is most apparent in the installations and sculptures that involve mirrors, obviously, but also in the photographs of glass and mirrored surfaces and in very early pieces where the large black mattes around the photographs became virtual mirrors when the frame of the glass was on top of them. But when I use mirrors I try to make sure there is a moment where the viewer becomes self-conscious of themselves as an audience. Similarly in the inkjet collages where the drawing lines and the cut marks, the evidence of the hand are obvious. It would be possible to airbrush them out but then they would be too perfect. H&E: Thanks very much Vikky for those insights into your practice!